Dura Automotive CEO Tim Leuliette: The industry must show it can make fuel-efficient, reliable products. Company: Dura Automotive Systems Inc.
Main point: The car industry needs to police itself. 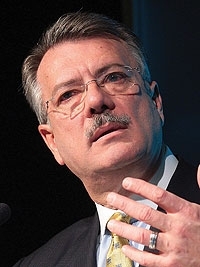 DETROIT — The industry crisis gives dealers, suppliers and auto executives a chance to show that automaking is vital to the nation, Tim Leuliette, CEO of parts maker Dura Automotive Systems Inc., told the Automotive News World Congress. "A good crisis is a terrible thing to waste," Leuliette said. "Let's not waste this one." Leuliette called for an umbrella association to push for a national manufacturing policy and educate the public on the millions of jobs and community contributions tied to the auto industry. He also called for higher energy taxes to drive car buyers to more fuel-efficient vehicles. Leuliette even proposed a name for such a group: the American Automotive Industry Association. It would represent the interests of carmakers, suppliers, dealers, labor and other stakeholders, he said. In addition to external communications, the association would help the industry by promoting a "common product creation process" to speed and reduce the cost of bringing products to market, Leuliette said. It would be an open-source information portal that would use the Internet to connect the automakers, suppliers, associations, universities, government agencies, unions and others, he said. "This is no pipe dream. There is a group working on this strategy right now," he said. He said the Obama administration could be asked to help fund "this collaborative, next-generation management and product development process." The industry organized and found a forceful spokesman in Jack Valenti to convince Congress and regulators that the industry could police itself, Leuliette said. The result was a voluntary rating system that labeled content G for general audiences, M for mature audiences, R for restricted and finally X. The auto industry, he said, faces a similar challenge in showing that it has made strides to achieve the kinds of quality, fuel-efficient and reliable products that the public can support. Turning to energy taxes, Leuliette said fluctuations in oil prices have consumers thinking small cars one day and buying light trucks the next. After the first oil crisis 35 years ago, he noted, every country in the world sought to reduce its reliance on imported oil. The United States tried setting corporate average fuel economy requirements, but "CAFE doesn't do it," he said. Higher federal taxes phased in over time would take some of the volatility out of gasoline prices, and car buyers would adjust. "When gas prices went from $8 a gallon to $10 a gallon in Europe, buying habits didn't change," he said. "But here, when they went from $2 to $4, they changed quite a bit." PRESENTATION: Timothy D. Leuliette, CEO & President, DURA Automotive Systems, Inc. SPEECH: Timothy D. Leuliette, CEO & President, DURA Automotive Systems, Inc.